As urban populations continue to rise, it’s more important than ever to find creative venues for green space. 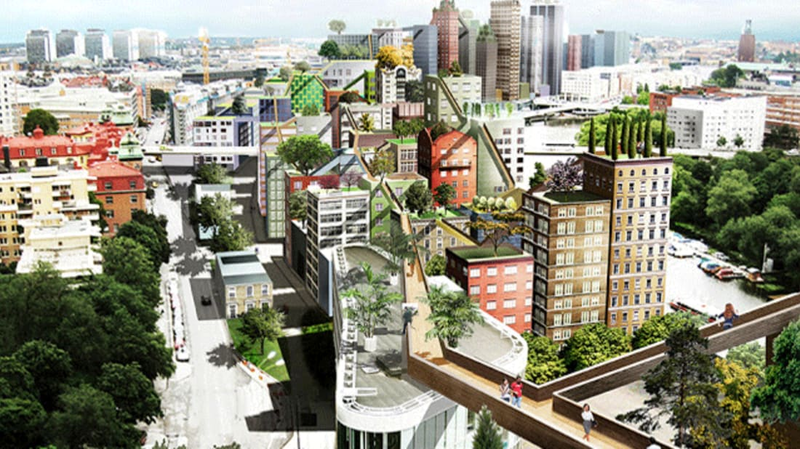 A team of Swedish architects may have found a solution for high rise-packed city blocks: clear skyways that weave in and around buildings. Anders Berensson Architects titled their new plan Klarastaden, or “clear city” in Swedish. The firm was contracted by Sweden’s Center Party to find a way to fully utilize the real estate above the train tracks beside Stockholm Central Station, without sacrificing the opportunity for urban greenery. Among the dozens of new buildings put forth in the proposal, the team has left room for rooftop gardens, terraces, and stunning pedestrian skywalks that would connect the structures above street level. The plan includes residential areas as well as the central business district, and the architects have come up with an innovative way to literally bridge the two. Commuters living in one of the apartments would be able to follow a skyway to the nearby Stockholm Central Station, from which they could take the train to work without ever stepping foot onto the street. The new urban area would include approximately 300 shops, 5800 apartments, and 8000 work places. According to the architects, 90 percent of the apartments would have access to a view of the adjacent lake, and the sun would be able to reach street level during the afternoon hours. This impressive feat of urban planning is made possible by the diversified heights and sizes of the proposed units. There’s no word on whether or not this plan will ever become a reality, but it could offer architects and urban planners elsewhere a possible solution to overcrowding. You can check out more concept art from the proposal below. Images courtesy of Anders Berensson Architects.